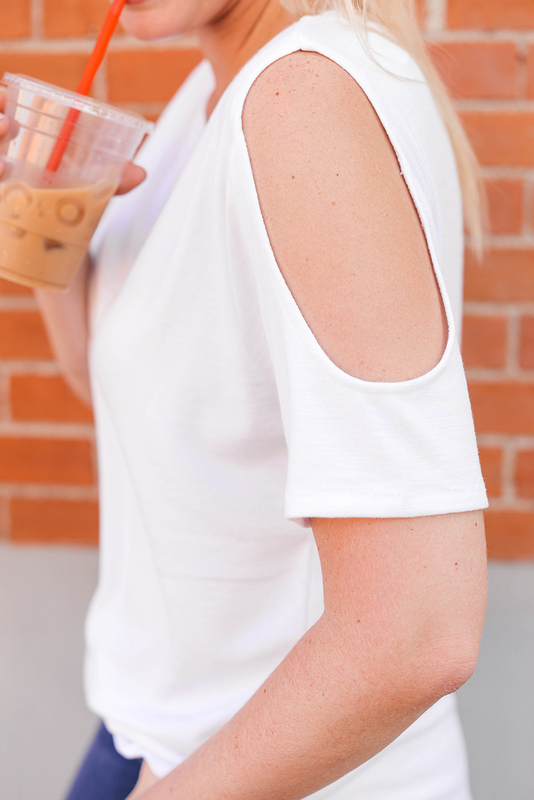 Not-so-basic basic tees. I’ve recently been stocking up on more and more tees. They’re not your average t-shirts, mind you. A few months ago I snagged this hole-y one, and then last month I ordered this open-shoulder tee and this mock-neck sleeveless tee. Both are by Rag & Bone and made of the soooooftest knit fabric! I’m excited to take the mock neck tee into fall with my favorite jackets and blazers for a modern, polished look. Most recently, I stopped in the GAP and found this tee in a very similar fabric to the Rag & Bone ones, but with a cute rolled-up sleeve style. I also found another mock-neck style tee in white! All are great go-to’s for my work-at-home routine and weekend style. 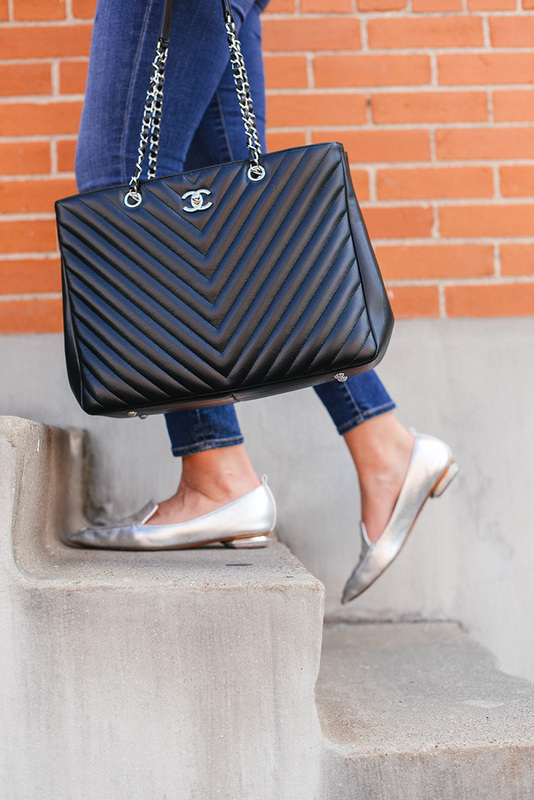 Stretchy, stylish flats. 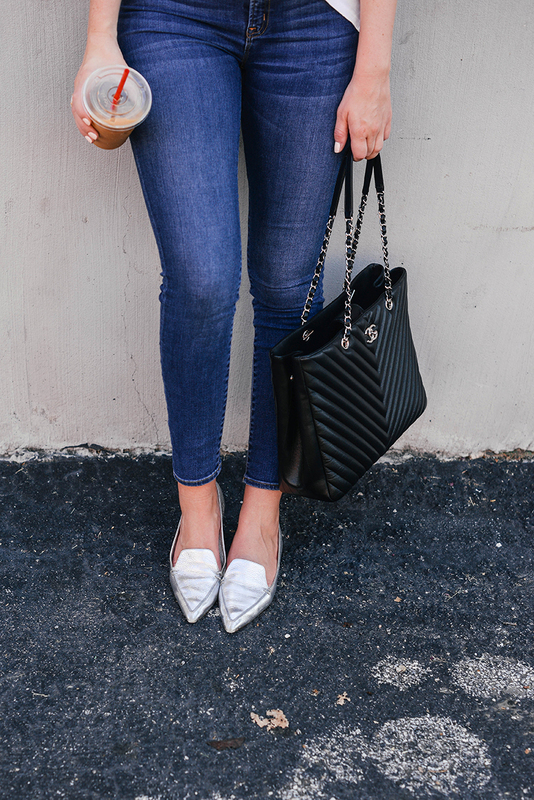 I picked up these flats last spring and have loved them! The leather is very pliable and stretchy, so even those of you with pesky and painful bunions would like them. In addition to being a fabulous everyday flat, they are an awesome choice for travel too. These flats come in a bunch of different colors – some new-season favorites include this cognac suede style, these leopard-print calf-hair shoes, classic black and this suede burgundy pair too. Stylish, but totally wearable all day long! Perfect-fit high-rise skinny jeans. There is nothing more annoying than having to hoist up your jeans on the reg – this happens to me when either the fabric is too stretchy or the rise isn’t just right. 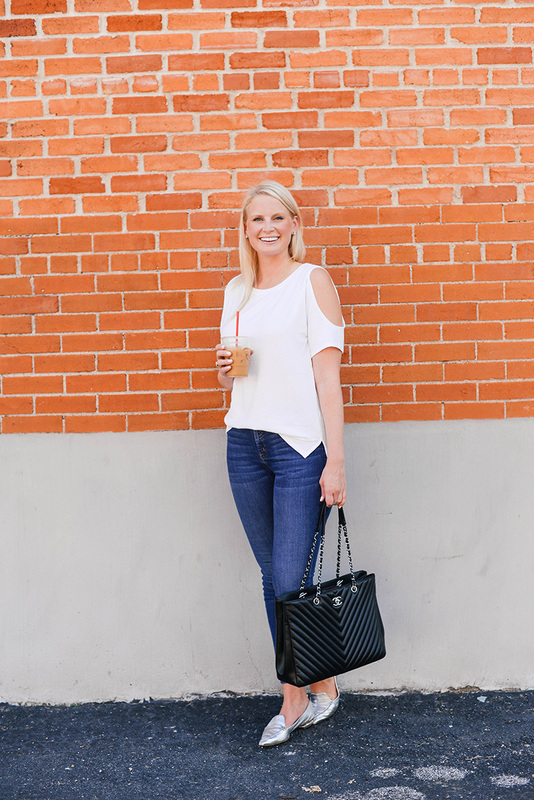 This pair of jeans has been my favorite everyday pair since I received them as a gift last fall! I even bought a second pair and third pair because I wear them nearly every single day (one in the same wash, and the third in a darker shade)! The high-rise hits me at just the right spot, so they stay put. They are just the right amount of stretch and are SO comfortable! I need to check out these jeans and great tee. Not so basic, basics are definitely pieces that my closet is lacking. 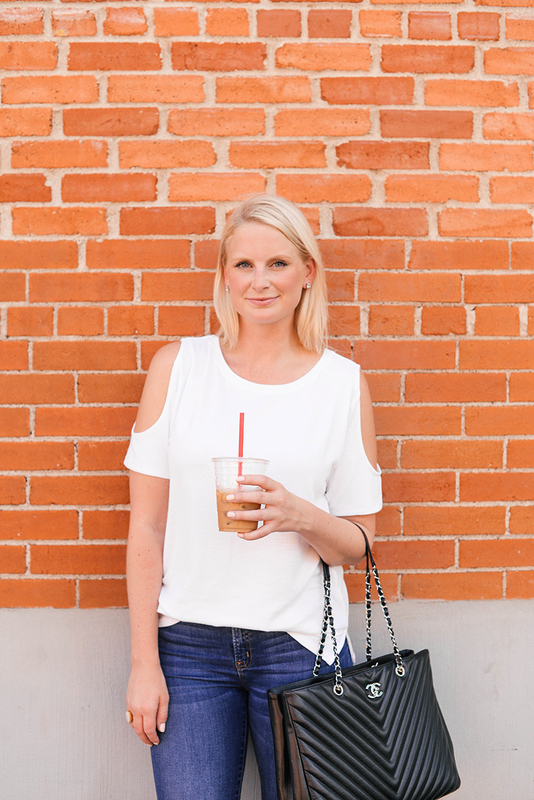 This cold shoulder tee is super cute and versatile! I’ve been loving metallic shoes at the moment! Your flats are just fab! Love this outfit – the bag is awesome! So chic Merritt! Loving this look on you! Happy Friday! I love taking a simple combo such as a tee and jeans and dressing it up a bit. Those flats are amazing!! Love this casual look! Comfy and chic! Agreed 100%….about the requirements for casual basics. Comfy is a must bc fidgeting is sooo not a good look. I love t shirts too, and I’ve started to buy more flats. I absolutely love this look. There is nothing like a white tee and a great pair of jeans.